Easter is quickly approaching and I’m sure, like us you’re looking for fun, family friendly activities to enjoy. Here are a list of purse friendly events in the Durham area that are easily accessible. Friday 14th 11 am – 4 pm – Pet some cute and cuddly farm animals. Saturday 15th 11am – 4pm – Get up close and personal with birds of prey from York Bird Of Prey Centre. On Friday and Saturday there will also be an Annual Easter Egg hunt around the street with free chocolates for every participant, collect an entry form Bertie’s Play Barn to join in. More info here. Mobile animal farm and a self-led egg hunt ( £4 for each child). On Saturday afternoon there will be face painting and a ceilidh band playing. Sunday will bring a brass band and free indoor and outdoor craft activities. Tickets for the animal farm and egg hunt can be bought from the Heritage Centre. More info here. Easter themed drop in craft activities for all ages, and an Easter themed trail. Normal admission charges apply. Children must be accompanied by an adult, for whom normal admission applies. £10.50 for adults and free entry for children under 16 years. More info here. Tickets cost £2.50 per child. More info here. Hunt the grounds of the Durham Dales Centre to find the hidden clues and claim your prize. Everyday 9am – 5pm, £1.00 per trail. Egg decorating, Paper crafts and more. Everyday 9am – 5pm, £1.00 per activity. Numerous activities including an Easter egg trail round the museum, make an Easter bonnet in The Pit Village school, learn about egg dyeing or make a paper flower at Pockerley Old Hall. You decorate an egg in the Dentist’s waiting room before rolling it in The Town park. Buy a tasty and freshly baked hot cross bun from Herron’s, make a Easter card or rabbit finger puppet at the farm. Or why not try your hand at egg jarping at 11.00am and 3.00pm at Pockerley Old Hall on Easter Monday. There’s an Easter Egg hunt around the grounds and all that complete will receive a treat at the end. There are crafts to make, face painting and giant games on the lawn. Activities are included in the admission costs. £12 for adults and £6 for children. More info here. Kids can meet the Easter Bunny who will be passing out chocolate eggs to all children who complete his Easter Treasure Hunt. There will also be Easter Games and a story telling session inside the house. Family friendly Easter chick hunt around the gardens. Normal admission charges apply, no further charge for participating in the Easter event. Adults £4 and children £1.50. Face painting, Easter bunny trail, egg decorating, mask making and other family friendly crafts. There are also two egg decorating sessions with Artist Anna Harding which must be booked in advance by ringing 01833 622145. No booking needed for the other activities and visitors can drop in at any point during the day. £5 charge for children. Adults are free. A range of Easter activities including an egg hunt, face painting, crafts. £1 entrance fee per person, family members go free. receiving a giant gold egg. There will also be face painting, a tombola and a raffle with some live entertainment. Free event. More info here. How about something a little less Easter related? Families can meeet a host of impressive creatures, including every child’s favourite flesh-eating giant, the Tyrannosaurus Rex, a Triceratops, Giraffatitan and Segnosaurus. An interactive show which is suitable for ages 3+. More info here. 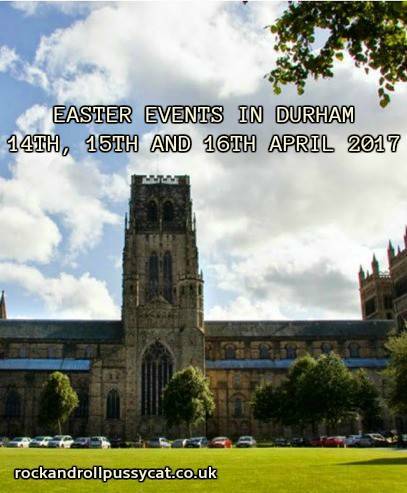 Do you know of any other Easter events in Durham that I’ve missed? Feel free to send me the details and I’ll add it to my list. Before setting off for any of the events above, make sure you check they’re still running by contacting the venues directly. Some great suggestions on there. Really want to do the Botanical gardens this summer and Bowlees is one I haven’t heard of either!